The school day runs from 7:50 am to 3:00 pm. Students may be dropped off starting at 7:15. K-5 students who arrive before 7:35 will be supervised in the cafeteria, and then will go to their classrooms at 7:35. Preschool students will go directly to their classrooms. Cell phones should NOT be used on the parking lot. Between 7:15-7:45 a.m. parents should park in the back of the building by the statue of Mary. Parents will walk students into their classrooms. After 7:45 a.m., students should enter the front glass doors and walk students to their classrooms. Parents should exit parking lot by the Sunray doors and wait in line with any K-5 students being dropped off. Cars will enter the lower lot from the ramp on Sunray Dr. Use caution and watch out for walkers arriving from the Sunray ramp or the Sunray stairs. Proceed to the side school door facing Sunray Dr. and drop off children near the school door. Please stay in line and do not pass cars that are dropping children off at the door. 11:45 Dismissal: Pick up at the front glass doors. Park on top lot by the church. 12:00 Early Dismissal Days: Pick up from the classroom only. Afternoon Dismissal: Students will be walked outside at 2:50 to the back doors by the statue of Mary. Students will wait with staff on the brick pavers. On rainy days or extreme temperatures, students will wait instead by the gym doors. Park in a marked space facing the school. Students will exit the gym door at 3:00 pm. Students will wait in the courtyard and grassy area near that door until they see their car or driver. Parents are encouraged to get out of the car and meet the students in this area. When students are no longer walking to cars, cars will be dismissed from the lot. Please wait until your row of cars is dismissed by a faculty member. Drive forward out of your space. Cars will exit the lot at the lower Pardee Rd. entrance (near Sunray Dr.) Cars may turn left or right out of the parking lot. Students walking home should exit the parking lot by the stairs to Sunray Dr. promptly at the end of the day. Students may not stay to play on the parking lot or in the field. Students who have not been picked up by the time the parking lot clears will be sent to after school care. 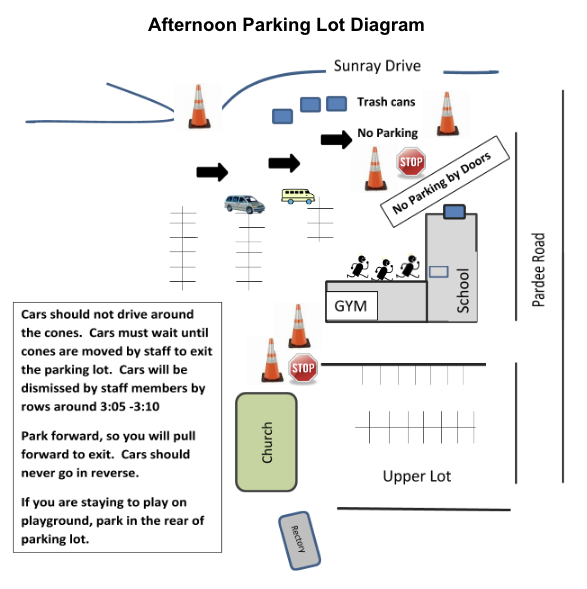 If you are in a hurry and cannot wait for the parking lot to empty, you may park in the upper lot by the church and walk to the gym entrance to meet your child. No cars should be parked by the lower exit to the parking lot near Sunray. This is a safety issue because that is how walkers exit the parking lot. A written request from parent or guardian is required for a student to leave school prior to dismissal. The note must state the reason for dismissal, the name of the adult who will pick up the child, and the time the child will be picked up. The adult must pick up the child in the School Office, not the classroom. No child will be dismissed directly from the classroom for any reason. This is for the safety and protection of the child. A child who misses more than two hours of school for an appointment will be considered absent one-half day, and more than four hours will be considered absent a full day.